Best of the John Le Carre novel to screen adaptations. The plot outline remains elusive for a great deal into The Constant Gardener. The morally flinching statement it makes is Pharma Companies test AIDS drugs in Africa as a humanitarian effort, however, it masks the testing of other drugs on human beings that often leads to organ failure. In the foreground is a love story between British diplomat Justin (Ralph Fiennes) and human rights activist Tessa (Rachel Weisz). It is not spoiling if I reveal Tessa is found dead at the beginning of the story. When Justin looks into her life, he discovers he never really knew her or her “cause,” he also in the process unearths a drug company conspiracy. Tessa was likely assassinated which sets Justin forward to not only avenge but complete her humanitarian cause. Of course, it hurts a husband to learn when his wife slept with another man. In this case for Justin, it was with his own occupational superior Sandy (Danny Huston), whom he needs to bargain with for information to trace his wife’s steps. Appearing in many flashbacks, Weisz has never been more impassioned than she is here playing a complicated, Earth-conscience woman (she won the Best Supporting Actress Oscar). Director Fernando Meirelles (“City of God”) works with dense plotting, complicated flashbacks and a puzzle-constructed narrative, yet ultimately builds from its elusive beginnings into something comprehensive. The bustle and chaos of Kenya is captured in a real and spontaneous way, people are always active, the camerawork fittingly active, and the action bridges the recognizably normal with the foreign components. But it’s all about the outrageous but valid indictment: Pharma Companies think Third World People are expendable, and the bureaucracy that exists between countries support such acts. In regards to the title, Justin is a constant gardener who paid more attention to flowers than his own wife when she was alive. It’s just one of those character tics. 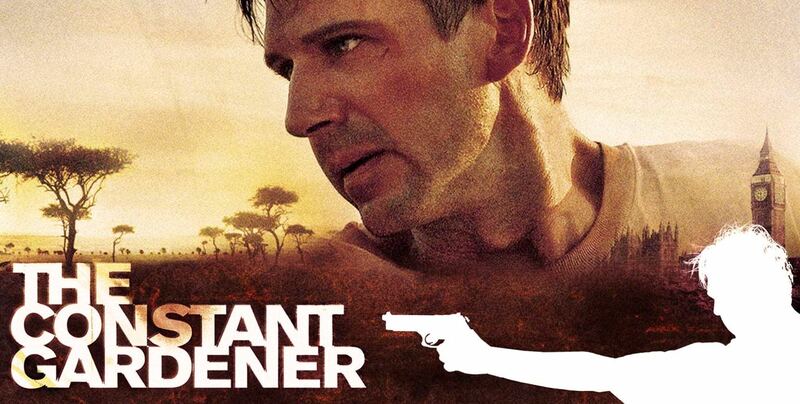 The drama of “The Constant Gardener” is heavy-duty stuff – impoverished Africans, drug-testing, the cynicism of modern commerce, bureaucratic duplicity – adds up as a real thinking man’s thriller. Film Cousins: “Dirty Pretty Things” (2002, British); “Blindness” (2008); “The Whistleblower” (2010, British); “In a Better World” (2010, Denmark).